There’s a high likelihood that a disease of some sort affects you or one of your relatives – every family seems to have ripples in its gene pool that define and shape its health dynamics. Your family might have a propensity for rheumatoid arthritis or a particular type of cancer. Whatever it is, there can be an instant family bond created by that disease – along with a sense of fate. That feeling moves some families to action. The Heywood brothers started PatientsLikeMe when one of them, Stephen, was diagnosed with Lou Gehrig’s disease in 1998. Nancy Brinker created a huge force in breast cancer research through the Susan G. Komen Foundation, named for her sister who died of that disease. Michael J. Fox, a father of four, started his remarkable foundation after he was diagnosed with Parkinson’s disease at the age of 30. But not everyone can garner the resources to create their own company or foundation; it’s hard to know where to turn in trying to make a difference. This summer, 23andMe is launching the Research Revolution to empower more people to jumpstart genetic research into the diseases that affect them and the people they love. This new research model makes it possible for large groups of people to assemble themselves into large-scale genetic studies without having to raise millions of dollars in funding, and then wait years for things to get rolling. Participants also get access to their own genetic information through the 23andMe Personal Genome Service Research Edition, which offers a snapshot of what their data says about more than 100 diseases and traits. We believe that if you volunteer for research, you should be able to see what you’ve contributed to the effort. 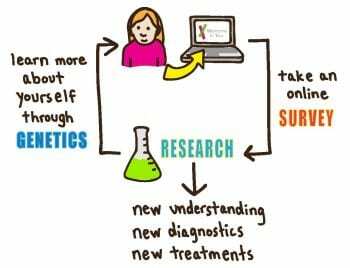 * Visit the Research Revolution page and vote for the disease you would most like 23andMe to study. * If you’re already a 23andMe customer, log into your account and complete any of the 23andWe surveys you haven’t taken yet. * Spread the word – especially to people who are patients or survivors of the 10 diseases we’re featuring. There’s strength in numbers. The more people who enroll in the Research Revolution, the more likely it is to make new discoveries about the causes and about the treatments of disease.